When taking your horse to Mexico, begin planning a couple of months before you travel. 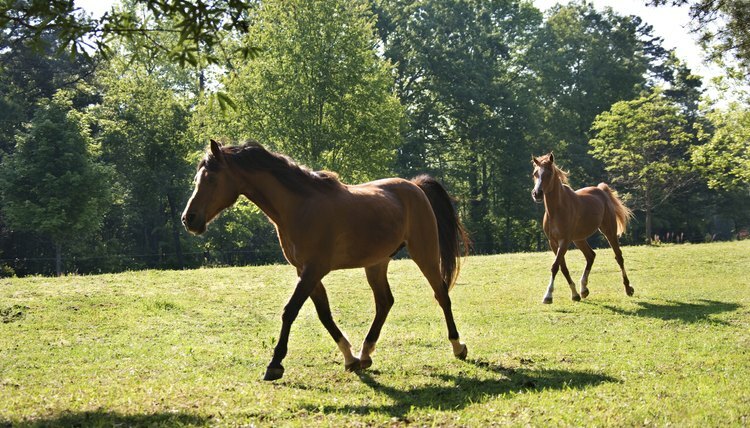 Your horse needs to meet certain health requirements, certified by both your local veterinarian and your state, U.S. Department of Agriculture-approved veterinarian. You also need to ensure your own travel documents are in order. Within 60 days of travel, contact the USDA Veterinary Service Office at the border crossing you plan to use and obtain the most up-to-date travel requirements, which change periodically. Within 60 days of travel, inform your veterinarian you need a U.S. Origin Health Certificate for travel to Mexico, including a Coggins test. If your horse needs vaccinations, they must be given at least 15 days prior to transport. Your veterinarian also needs to certify that your horse if free of certain infectious diseases. At the same time, if you plan to drive your horse to Mexico, hire a customs broker, which is required by the Mexican government. Your veterinarian will need information from the customs broker to include on the health certificate prior to sending it to your state's USDA-approved veterinarian for certification. If you plan to travel by air, check the USDA website for the updated list of airports equipped to handle equine transport. You'll need to arrange transportation from your home to the airport, and from the destination airport to your final destination in Mexico. If you plan to travel by land, check the USDA website to locate an approved border crossing facility. You need a valid passport for entry into Mexico. Apply for your passport at least six months prior to travel if you don't already possess one. If you are moving to Mexico, ensure your proper Mexican visas or other immigration documents are in order. If driving your horse across the border, you need original copies of your vehicle and trailer title and registration, a notarized letter of approval for travel to Mexico from lienholders and valid insurance for driving in Mexico. Not included in traditional American vehicle insurance policies, most insurance companies can provide a temporary rider for Mexican travel. If you drive your horse across the border, a Mexican veterinarian will inspect your horse and trailer at the border crossing. The customs broker you hired will help facilitate this process. You are not allowed to carry hay, feed, medications or dietary supplements into Mexico, so ensure you plan ahead and know where to buy these items for your horse after you cross the border. You may haul tack, brushes, blankets and other grooming or riding equipment into Mexico. Once your horse and trailer have passed inspection and your documents are verified, you're ready to travel in Mexico. On the day of your crossing, begin early in the morning and allow an entire day to get through the process. If possible, avoid crossing on a Friday. How Much Land is Legally Required for One Horse in Michigan?